Cheese for baking, desserts, mousses and creams you need to grind, especially if he is coarse. Cheese in any product shall be the air mass, not Packed in large lumps. Start to learn how to choose a good cheese. 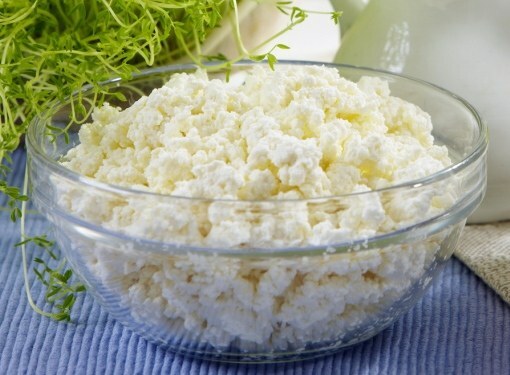 The most useful is the low fat cottage cheese and cooked raw way, that is by ripening of milk or addition of yeast. In cooking, often used fat cottage cheese. A good curd must be fresh, not have odors, except sour milk, have white color with light cream color. The grain from a good cheese secondary, and he himself, according to the structure forms layers. For grinding the curd, you can use several ways. For getting out of cottage cheese smooth mass first and the most ancient method – grinding through a sieve. Cottage cheese is pressed (by hand or under pressure) the excess fluid is serum. Then you take an ordinary sieve or colander medium in size with very fine metal mesh. Large spoon, better wood, cheese in small portions is superimposed in a sieve under pressure spoon frays. Grated cheese is getting air, has no lumps, graininess. To achieve the necessary small structure, a single grinding. If the farm sieve no, you can use a meat grinder. Before it is also important to remove cheese from the excess fluid. And the grinder should be washed thoroughly and wipe all parts dry, to avoid foreign odors (cheese quickly absorbs odors). In the meat grinder of superimposed curd and milled as stuffing. The nozzle is better to choose the small. If necessary, you can scroll the cheese twice. You can make the cheese less grainy and more homogeneous with tolkushkoy for mashed potatoes with holes. This method is not so time consuming than grinding through a sieve, but the result is not so good. After you sieve the curd obtained is more homogeneous, and after tolkushkoy of the grains in the cheese is retained. In a pinch, you can use a grater. Not the smallest, for potato pancakes, not a big beet and the average. To RUB cheese on a grater will have hands. Dial up a handful of curd, squeeze into a tight ball and led the float up and down, pushing the cheese curd until it will be inside. You may need to do this operation twice. The most convenient and easiest way of grinding the curd today – blender. Curd in a blender it turns out not worse, than the rubbed through a sieve, and the process is much easier and faster. For blender excess water from the curd pressing is not necessary, otherwise dry weight blender will not pull.